Scenes from Miyakejima can look downright post-apocalyptic. 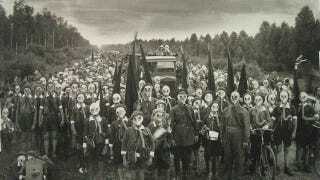 Each resident on the tiny Japanese island is required to carry a gas mask, just in case they need to quickly pull it on. But why? Miyakejima, which lies 180 km south of Tokyo, is home to Mount Oyama, an extremely active volcano. In June 2000, Mount Oyama began a series of eruptions that released so much toxic gas into the air that the entire island had to be evacuated and was closed to human habitation for more than four years. In 2005, roughly 2,800 residents chose to repopulate the island, taking back the island's abandoned buildings. But even when Mount Oyama isn't mid-eruption, it continues to spew sulfuric gas. All residents and visitors are required to carry gas masks, and an air raid alarm goes off when the sulfur levels get unhealthily high. A third of the island is still off-limits to human travelers, and the government mandates health checks of all residents. But all that poisoned air does have its perks. Gas mask tourism is a huge draw for people who want to pretend they're living in the post-apocalypse.